Dia de los Muertos, or Day of the Dead is a Mexican holiday falling on November 1 and 2 that is often celebrated with sugar skulls, dressing up like pretty señorita skeletons, and revelry. But at the heart of holiday is a deeply meaningful celebration of our loved ones who have passed on. The holiday is based on the belief that during the first days of November, the veil between this world and the next is very thin and that our loved ones can return to earth and visit. In Mexico, families decorate family graves, picnic in the graveyard, play games, listen to music, and pay their respects to their loved ones who have passed away. Ofrendas (altars) are decorated with marigolds and other flowers, as well as pictures of the dead and things they favored in life. This year, the CCAC will be creating an art installation that will speak to those memories. 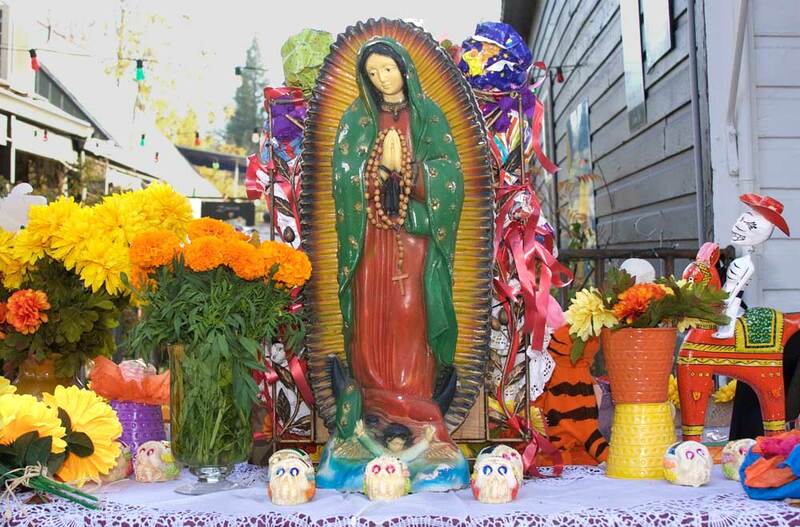 at the annual Murphys Dia de los Muertos festival on November 4, and we're hoping that our artists and members will help make this project successful. We're looking for people who can help build the display, and to help guide visitors. Murphys also needs help creating items that make the annual procession special. They have some giant puppets, but would love some artistic help in making the procession even more exciting. This is a chance to exercise your creativity! The CCAC is planning to build a labyrinth and an ofrenda (altar), and we're going to help with the procession. If you're interested in being involved, please call Maggie at the gallery (209.754.1774) or email her at ccacinbox@gmail.com. It's a beautiful holiday and we hope you'll join to help.